Radical Rhubarb was the codename for this month's GeekDinner, held at The Wild Fig restaurant (map), near The River Club, in Observatory. As usual, we ate plenty of good food, many people drank good amounts of the wine supplied by Delheim, and several interesting talks were given - taking risks by carrying out small actions, running a community-based support forum, and an introduction to a constructed language called Toki Pona. And as always, of course, we got to giggle at the fun and popular slideshow karaoke. If you're interested in attending one of the dinners, take a look at the website, subscribe to the announce list, and put your name down for the next GeekDinner! Posted in Events and tagged geekdinner, restaurant on Thursday, 28 January, 2010 by Paul. 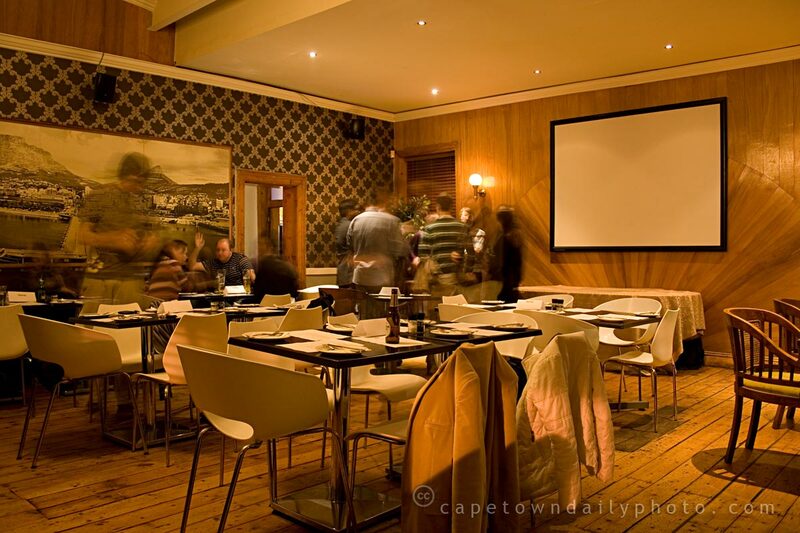 Café Max was the location for the 17th GeekDinner, codenamed Quarrelsome Quince. We were introduced to Café Max's spectacular buffet dinner, as well as two brand new Internet start-up businesses based in Cape Town. The first, Personera, allows you to import photos (along with your friends' birthdays) from Facebook into a calendar that they then print and mail to you. The second was JobCrystal, a new (and different) careers portal that matches you to the most suitable available jobs, based on information you provide and questionnaires that you complete. Dinner at Café Max was great - the dessert of Malva Pudding with Creme Anglaise was to die for, and the rare rib-eye beef was perfectly complemented by the Delheim red wine. The area that you see in this photo is a large hall alongside the main restaurant, and it's actually a lot prettier and more cosy than it appears here. It really is a nice little restaurant; take a look at their website to see what I mean. Posted in Events and tagged geekdinner, restaurant on Saturday, 28 November, 2009 by Paul. 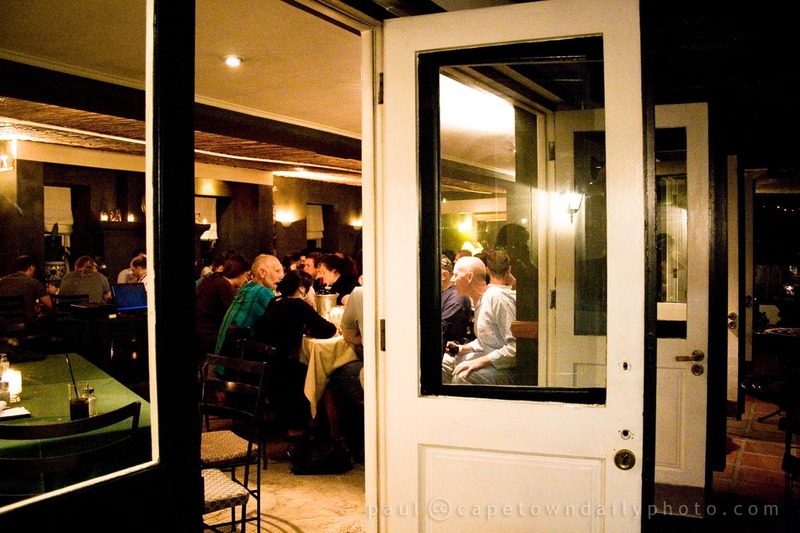 Well done to everyone who braved the excessively high winds in Cape Town to attend GeekDinner! 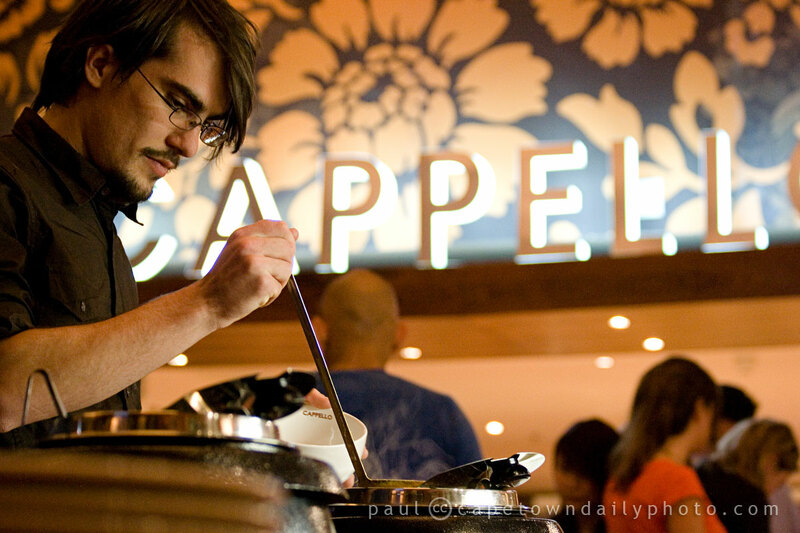 I spent a few minutes outside Cappello to capture a few night shots of Cape Town and found it impossible to keep my hand steady enough to take the shot. Eventually I leaned up against a seemingly-sturdy pole to steady the camera, but alas, this was even worse - the wind was rattling the pole like a jackhammer rattles the stout construction worker holding it. For many people, the word "geek" still conjures up images of socially awkward people interested only in chemistry, physics, astronomy and computers. 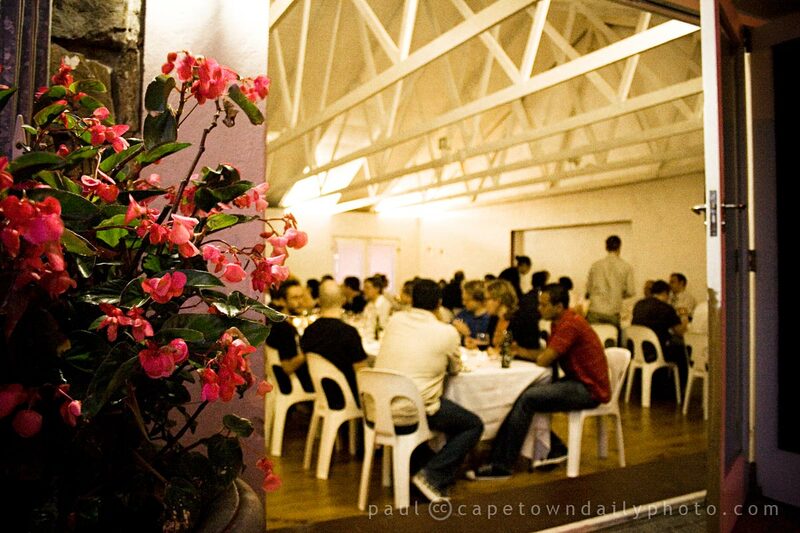 This is not the case at Cape Town's GeekDinner meets. Also, over the past few months I've noticed an interesting shift in the gender distribution at GeekDinner events. Even though the guys still clearly dominate in numbers, it seems as though there are more and more women at each event... which, believe me, is something that I'm confident the guys are extremely happy about. Posted in Events and tagged geekdinner, restaurant on Saturday, 3 October, 2009 by Paul.